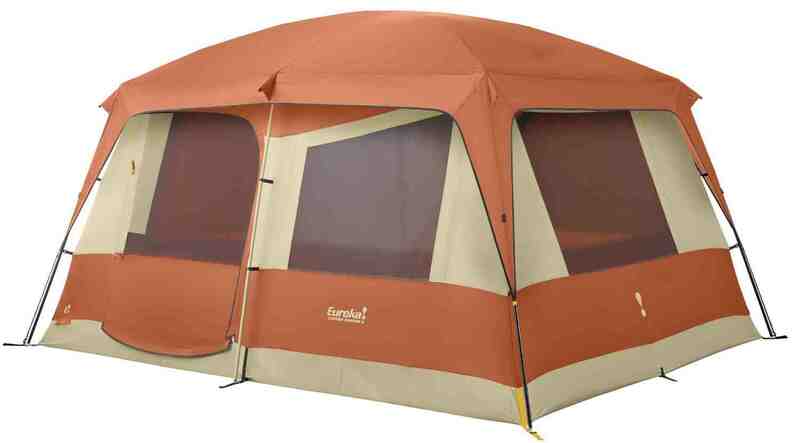 The Eureka Copper Canyon Tent is likely the most popular family cabin tent. It offers the headroom and inner space of a wall tent with the ease of setup of a family tent. The five Eureka Copper Canyon Tent models comfortably sleep from 2 to 8 adults or larger families with small children. The 7'+ inner ceiling height makes the tallest campers feel comfortable. The vertical tent walls are well suited to cots and raised mattresses. The side opening doors have a zipper along the bottom and another up the side and over the top. The doors have twin track zippers, which means that a second zipper runs alongside the main zipper in order to open the storm flap over the door screen. Strips to the side of the door flap secure it open. A half rainfly covers the mesh ceiling panels. The Copper Canyon is a cabin dome tent style, where rigid steel poles support the tent along the sides and flexed fiberglass poles shape and support the ceiling and rainfly, so that they can provide extra height and shed rain. Rectangular window storm flaps roll down and fit into a pouch below. Zippers at the sides and toggles along the top secure the storm flaps closed to keep rain out. Windows in the doors have full zipper closures, with a curved zipper track along the top and outer side and a straight track along the hinged side of the door. Pockets at the bottom of the divider provide storage for personal items. #8 self-healing door zippers give good performance and are easy to work. A tip down floor lip below the door allows floor sweepings to be swept out without the need for a dustpan. A gear loft is included for storing small camping gear off of the floor. A power port in the lower wall next to the door allows an extension cord to pass into the tent. The tent body dimensions are 8' wide x 8' deep x 7' high at the peak. This tent offers the same ceiling height as the largest Copper Canyon size. 7' of headroom in a small leisure tent is unusual. The tent features a roll-back door in front and a large window on each of the other 3 walls, which provide excellent ventilation in warm temperatures. No need to reorient the tent, if the winds change direction. The flaps on the roll down windows store into a pocket at the bottom of the screen. The 64 square feet of floorspace is rated to sleep up to 4. The CC4 should comfortably accommodate 2 adults. Because of the cabin style and steep walls, 2 twin air mattresses should fit inside and allow a bit of room in the center for packs and dressing. Four 19.5 mm (3/4" diameter) steel poles support the tent at the corners and in the middle of the long walls. Two 12.7mm (1/2") fiberglass poles tension and support the ceiling. The CC-4 is a is 4 pole cabin dome tent and weighs about 18.5 lb. The tent body dimensions are 10' by 10' by 7' high. The 100 square feet of floorspace is rated to sleep up to 4 to 5 campers. The Copper Canyon 6 should comfortably sleep 3 to 4 adults. This tent is a larger design of the CC-4. 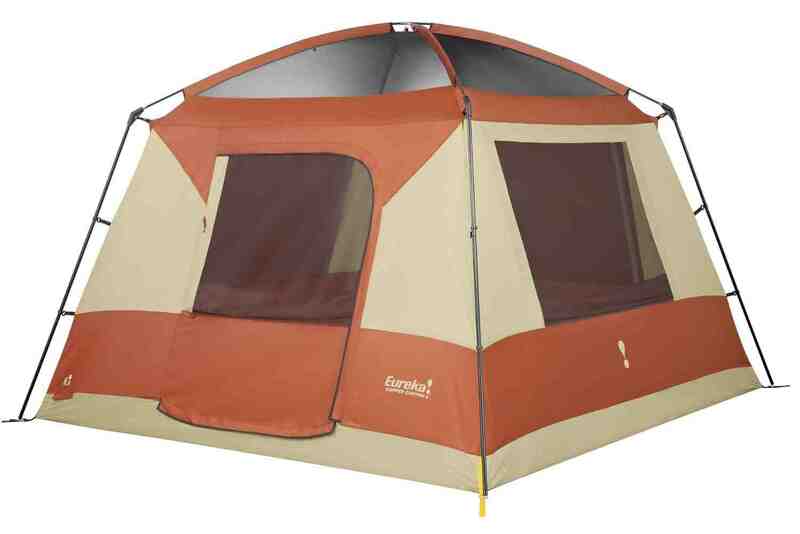 The Copper Canyon 6 tent should comfortably hold 2 large camping cots with room in the center for traffic and gear. A queen size air mattress will fit with room at the side for gear and dressing. This would work well as a large solo car camping tent with room for a cot, table, chair, etc. With 7' of height, the Eureka Copper Canyon 6 Tent is one of the tallest 10' x 10' tents available to family tent campers. Four 19.5 mm (3/4" diameter) steel poles support the tent at the corners and in the middle of the long walls. Two 16mm (5/8") fiberglass poles tension and support the ceiling. The steel corner poles are 19.5mm (3/4" diameter), and the fiberglass ceiling poles are 16mm (5/8"). This tent weighs 23 lb and fits on a 10' by 10' tentpad. These tents will fit on a 15' x 15' tent pad. These sizes feature a removable divider that hangs on loops and toggles from the tent ceiling. It can be zipped open in the center, drawn to the sides and tied off. These tents offer more usable floorspace than campers will find in any trailer. The floorspace can be furnished with camping equipment however campers please. The tent body dimensions are 13' wide by 10' deep by 7' high. The tent divides from front to back into 2 rooms, each 6'6" wide by 10' deep. 2 doors, one each in front and back, lead into a separate room. A window on the tent wall next to each door and also one on each side wall provide excellent ventilation. 6 pockets are available on the walls to store small items off of the floor. The 130 square feet of floorspace is rated to sleep up to 8. The CC-8 should comfortably sleep 4 to 6 adults. The tent is large enough to accommodate 4 regular cots, 2 queen air mattresses or several twin air mattresses. Four 19.5mm (3/4" diameter) steel poles and two 16mm (5/8") fiberglass poles support the tent at the corners and in the middle of the long walls. Three 12.7mm (1/2") fiberglass poles tension and support the ceiling. The CC-8 is a 6 pole cabin dome tent and weighs about 34 lb. This tent is a larger version of the CC-8 design with the addition of an extra ridge pole in the rainfly to support the larger fly area and to shed rain. The tent body dimensions are 14' wide by 12' deep x 7' high. The tent divides from front to back into two 7' wide by 12' deep rooms. The 168 square feet of floorspace is rated to sleep up to 12. The CC-12 will comfortably sleep 6 adults. This tent will hold up to 4 queen air mattresses. Four 19.5 mm (3/4" diameter) steel poles and 2 16mm (5/8") fiberglass poles support the tent at the corners and in the middle of the long walls. Three 12.7mm (1/2") poles support the ceiling. The CC-12 weighs 38 lb. If the divider is removed, the Copper Canyon 12 cabin dome tent will have the floorspace of an outfitter canvas tent. Large cots could be situated around the floor. Sportsmen should still try to avoid more than moderate winds with this tent, as it has a large wind profile, and the frame is not strong enough for strong winds. A sheltered campsite would reduce the wind load on the tent in blustery weather. The plastic elbow connectors, fiberglass poles and other features suit this tent mainly for leisure camping and not for strong weather in open campsites. These sizes are too large for a 15' x 15' tent pad and will likely need to be pitched on open ground. Campers should inquire whether an oversize tent pad that would fit this tent is available at a local campground. Eureka's largest Copper Canyon size is a combination tent and screen room. It's not the largest in floor area, but it has the longest wall of any CC size. This may affect where it can be set up. The tent body dimensions are 16' wide x 10' deep x 7' high. The tent divides from front to back into an 8' wide by 10' deep tent body and an identically sized screen room. However, a solid fabric wall and door, instead of a hanging divider, divides the tent. 2 doors, both on the front wall, offer access to the tent body and to the screen room. The tent features 6 windows, 2 in the exterior doors and 4 more in the walls. The 80 square feet of the tent bedroom floor is rated to sleep up to 5. It should comfortably sleep 2 or 3 adults or a family of 4 with young children. A camping couple looking for a tent and screen room combination should consider this tent. The screen room does not feature a floor. Campers can set up chairs and tables there without worrying about damaging floor fabric. They can also have drinks and meals there without worrying about any spills damaging tent floor fabric. Large windows on the walls offer a good view of surroundings while keeping out flying insects. A "sod cloth" fabric floor border that extends a few inches around the inner tent walls allows campers to add their own ground cloth or tarp and still be able to seal out crawling insects, as well as prevent drafts and rainspray from getting under the walls. The CC-5 + screen room weighs 35 lb. With the addition of a ground cloth, the screen room can also be converted into a sleeping room, doubling the sleeping capacity of the tent. It would be nice, if Eureka would shave a foot off of the width of this tent and add a couple to the depth, so that it would better fit on a 15' x 15' tent pad. For campers who are not concerned about using tent pads, the size and shape of the tent will not be an issue. With a mesh ceiling and large windows on all sides and in the door, the Copper Canyon offers a lot of ventilation for warm weather. The divider is loosely woven, allowing more air to pass through for better ventilation between the rooms in warm weather. Non-closable ceiling mesh means that the tent may not retain heat and may develop a draft on cool evenings. The windows can be closed to keep out any breeze. Campers may need to take extra measures to make sure that they are warm enough on cool evenings in this tent model. Steel poles support this tent in moderate winds. Guyout points on the rainfly at the upper tent corners allow campers to thoroughly guy out the tent to stabilize it. The tent walls on the large sizes can billow in a good breeze. Campers should consider a fabric clip and separate guyline to alleviate this. The elbow connectors between the wall and ceiling poles are sturdy plastic. however, they are unlikely to take the stress of a strong wind. Unlike a dome tent, the frame of a cabin tent needs to remain rigid in the wind. This will help protect against breakage. For this reason, campers should thoroughly guy out the tent. 1200mm coated fabric on the rainfly, walls and floor provides extra waterproofness over the life of the tent. The tent has a half rainfly, which will allow the windows to remain open a bit at the top in vertical rain. However, the tent will only offer a little ventilation in the rain. The doorway(s) will not be sheltered from rain. Campers should consider bringing a tarp, canopy or additional cover to extend the roofline of the tent for long periods of rain. Campers may also be able to clip a plastic sheet around the doorway in the rain to be able to get in and out without letting rain in. A bathtub floor helps prevent standing water from seeping through seams. The ceiling and floor are factory sealed, but any exposed wall seams will need to be sealed by the end user. Non-closable ceiling mesh means that campers will have to position the tent more carefully in wind-driven rain. The half rainfly should perform in vertical and light wind-driven rain. However stronger gusts may blow some rainspray under the fly and through the ceiling mesh. Strong gusts are not a problem at a sheltered campsite, but may be experienced, if the tent is exposed to an open area. The Eureka Copper Canyon is a cabin dome tent and features vertical steel poles on the walls which support sturdy flexed fiberglass poles in the ceiling. 75 Denier (1.9 oz), 190 thread-count, 1200mm-coated rainfly, walls, and tent floor protect against rain and seeping moisture. The heavy duty 68 denier, no-see-um mesh screen is more durable and suitable for young children or pets. The thicker fiberglass yarns and smaller no-see-um openings, or aperture, in the mesh screen will somewhat reduce visibility and airflow. However, there is a lot of screen space to make up for this. Eureka often only allows 2' of width for a sleeping space when calculating the capacity of the Copper Canyon. This is not enough for adult leisure camping. Campers will need to keep this in mind when determining whether the tent is large enough for their family. Heavy duty nylon elbow connectors are attached to the outer tent fabric in the upper corners. Fiberglass poles insert into sleeves in the ceiling, flex and insert into the nylon connectors to tension and arch the ceiling. Steel vertical wall poles insert into the other end of the corner connectors and into pins at the base of the tent in order to raise the ceiling assembly and create a self standing tent. Since these tents are quite tall, campers may find that it is easier to place the rainfly over the tensioned tent ceiling before the wall poles are connected. 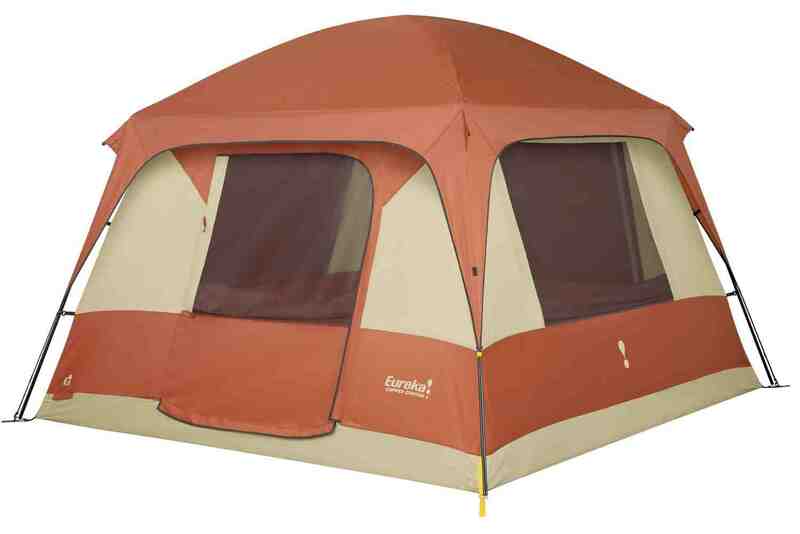 The Eureka Copper Canyon Tent is very popular with family campers. The economical design offers families a large tent with a high ceiling for the money.